Gardenia at Burke Mountain is an exclusive development of only 15 homes, nestled within an expansive 2.3 acre green belt on Burke Mountain. These well-designed 4 and 5-bedroom open floorplan homes range from 3400 to 3900 square feet, and include a fully finished basement and a legal, 1-bedroom suite. There are 3 professionally designed finishing styles, 7 exterior colors and styles and over 7 total floor plans to choose from. East Village Developments is a Canadian company, and have been in the construction business for over 25 years. 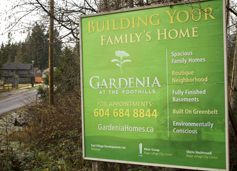 Gardenia by East Village Developments is now SOLD OUT. Disclaimer: Rebecca Permack is an independent Realtor with Royal LePage West Real Estate Services. Although she works closely with many developers in the area, she is not directly affiliated with the developer or development, and does not represent them in any way..